The Sonoran Desert is located in North America and covers the southwestern parts of the state of Arizona, southeastern parts of the state of California in the United States and the state of Sonora in Mexico. 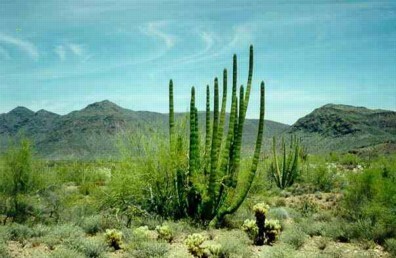 The Sonoran Desert's location is at latitude 25° to 33° North and longitude 105° to 118° West. The key to the Sonoran Desert's climate is the amount of rainfall which falls. More rain falls on the Sonoran Desert than any other desert. When it does get rain, the desert is damp, and the air is cool. When it has no rain the desert is really dry and really hot. When the desert is windy, the sand gets picked up and tossed around which creates a sand storm or if the wind is blowing in a certain kind of way, it creates a whirlwind or dust devil. These mini-tornados move across the desert floor and they most often occur in hot weather. The desert valley is hot while up in the mountains it is cool and some mountains are even snow covered. The seasons are like any other. Spring is a time when flowers bloom if the winter and fall had enough rain that year. There is summer and in the summer it rains the most and that helps summer flowers grow. Then fall comes with a cooler breeze, which lets the deserts summer heat wear away. Winter brings snow to the mountains and cold air to the desert valley. Precipitation in the desert is probably less then any other North American state, but it is still a lot for a desert. The Sonoran Desert receives 10 or less inches a year; the eastern part of the Sonora desert, in Baja California, receives 10-12 inches because Baja is by the ocean. The ocean storms brew up more often producing more rain, while the western part of the desert only gets about 2 inches and in the mountains they receive 25 inches. The geography in the Sonoran desert is quite interesting. The Sonoran Desert is located in two states, Arizona and California, and two countries, Mexico and United States. The rivers that flow through the desert are the Colorado River and the Gila River. The Salton Sea, the Gulf of California and the Pacific Ocean are bodies of water next to the Sonoran desert. The mountains in the Sonoran Desert are Mount Kofa and Mount Catalina; Mount Catalina receives most of the snow. The Sonoran Desert is a hot place to be. It is sandy with a lot of cactuses, but there are forests on the mountains and it is a lot cooler in the forests. The Indians that lived at the edge of the desert carved designs into the walls or rocks. The plants in the Sonoran desert are very interesting, such as fairy duster, jimson weed (poisonous), tumble weed, night blooming cereus, devils claw, ghost flower, hedgehog cactus and showy four o clock. There are some other plants with out really interesting names: The desert Christmas cactus, prickly pear cactus, desert willow, western wildflower, cave primrose and desert lupine. These desert plants adapt to their climate by seeking coolness. Their roots collect water when it rains. The saguaro cactus has shallow root systems allowing the cactus to store up to 160 liters of rainwater allowing it to live for weeks at a time without water. The other adaptations of the desert plants are that they live in the mountains where shade and coolness is found. The Sonoran Desert animals fit in to the environment perfectly. Some of the animals in the desert are the Mexican gray wolf (el lobo), the mountain lion (cougar or puma), the great horned owl (Bubo virinus), the golden eagle (Aquila chrysaetos) and the rattlesnake. The Sonoran desert is also the home to the Mexican jumping beans. Mexican jumping beans are fruits of a shrub. The movement of the moth larva in the bean makes them jump. The adaptations of the desert animals to the desert home are quit simple. The animals or reptiles can find little hideouts were the sun cannot get to them. Other animals live in the mountains were coolness and shade is found with green forests but the animals have another talent. They sleep in the daytime and the heat does not bother them. Most of the animals are nocturnal, which means they hunt at night when no heat of the day is found. The Sonoran Desert is changed. We humans have been turning the land from the desert into tourist attractions. These parks have spread for miles taking up the land that belongs to the wild life. Then these creatures are pushed out of their natural habitat. Ranches have also been taking up the desert land and with our livestock. People plant crops and some of the seeds have been picked up by the wind or have been picked up by a bird and the seeds start to grow were they land. This cycle begins again and after awhile the desert starts to have plants that do not belong in the desert. The Sonoran Desert is a wonderful place but you would never want to be stranded there. The desert has wonderful plants and animals and really beautiful sunsets that fade away on the deserts horizon. Cheek L. W. Arizona 1995, Odors Trove Publications, Inc.
"Wildlife of Baja California ", Card 38, Wildlife Explorer, International Masters Publishers. USA. "Wildlife of the Sonoran Desert", Card 54, Wildlife Explorer 1999, International Masters Publishers. USA.